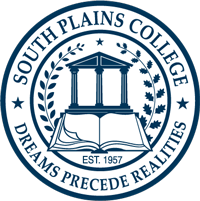 South Plains College’s interactive, fully online catalog contains a number of features to assist you, including advanced search options, user-friendly navigation and a personal portfolio to store favorite programs and courses. If you are new to our online catalog and would like to learn more, click the at the top right of any page. You may add items to your own personal Portfolio as you browse through the online catalogs. The Portfolio feature will retain a list of courses, programs, pages, divisions and saved searches that you find interesting and wish to save for future visits to the online South Plains College catalogs. To add items, click the Add to Portfolio link located at the bottom right of the page. This will open a new pop up window that displays all items currently in your Portfolio. This Catalog is an official bulletin of South Plains College containing policies, regulations, procedures and fees now in effect. We urge you to study the contents of this Catalog carefully. As a student, you are responsible for observing the regulations contained within this document. The College reserves the right to make changes at any time to reflect the current board policies, administrative regulations and procedures, amendments by state law and fee changes. Course descriptions give a broad outline of course content. Due to instructional differences, some variance in course content may occur. Nothing in the Catalog is to be interpreted as part of a contract. This Catalog is for information only and is subject to change. Copies of information from the 2007-2008 academic year and earlier are available from the Office of Admissions and Records located on the Levelland Campus in the Student Services Building or by contacting (806) 716-2572 or emailing admissions@southplainscollege.edu.